New faculty spotlight: Timothy C. Guetterman, Ph.D. The Department of Family Medicine is pleased to welcome new assistant professor Timothy C. Guetterman, Ph.D., M.A. Prior to joining the Department as junior faculty, Dr. Guetterman held a postdoctoral fellowship in the Department. Timothy C. Guetterman, Ph.D., M.A. Hi Tim! Can you tell us a bit about your background? My background is mainly in program evaluation and social sciences. I have been involved in evaluation, mainly of health-related and educational programs for about 15 years and did that work exclusively for about seven years. For me, evaluation was fun and rewarding because it is very practical and applied. Through evaluation, we want to know if a program did what was intended in the way that was intended and did it help the people we wanted to help. Ideally, that information is then used to improve things and help people better. That work greatly influenced my desire for a Ph.D. and post-doctoral training in research methods. My Ph.D. then is in quantitative, qualitative, and psychometric methods. As a methodologist, I actually do research about research and help people solve problems about the best way to do research. What unique skills and perspective do you bring to the Department? I bring skills in mixed methods research although many of my colleagues in the Department are more experienced than me. Mixed methods involves the collection, analysis, and integration of quantitative and qualitative data. For example, we might use mixed methods to understand not only whether a technology-based intervention to support patients in primary care was effective, but also to understand their experiences, and how to improve the program. Mixed methods is really my specialty, and it is a relatively new methodology. I am very interested in further developing the methodology and I do quite a bit of work around how we can bring these different data sources together. So, I try to advance methods of integrating qualitative and quantitative data through the use of software, through visual displays, and through how we report our results. Also, I think I bring a unique perspective in that I am not trained in medicine but in educational psychology and research methods. My background has been invaluable in many of the health communication projects I have become passionate about. What projects are you currently work on? I have been able to work with wonderful senior colleagues, like Michael D. Fetters, M.D., M.P.H., M.A., John W. Creswell, Ph.D., Tammy Chang, M.D., M.P.H., and James E. Aikens, Ph.D., in the Department. A majority of my projects are related to enhancing health communication using technology. For example, I have been involved in research to provide communication training using a technology called MPathic-VR. Through this project, we use virtual humans, which are realistic and simulate a real conversation with a patient. The technology is so cool and especially exciting because it gives the learner a chance to practice hard conversations. It has shown positive outcomes. The project draws on my background and interest in health, communication, education, and technology. I am working on a grant that will hopefully allow me to continue to use and develop the technology to address public health issues. We have also started an exciting new program at Michigan to provide workshops and consultation around mixed methods.  It is called the Michigan Mixed Methods Research & Scholarship Program (M3RSP). Finally, I have had the privilege of working on research projects with U-M's Department of Emergency Medicine faculty. Much of that work has been doing research on research. One project focused on the process of developing complex adaptive clinical trials. A current project I am on is to study how Institutional Review Boards handle research on emergency conditions. Working with the Department of Emergency Medicine has been a tremendous experience. What is your research passion? I am certainly passionate about mixed methods research and working on ways to advance the methodology and ensure it is conducted rigorously. My research passion is how to enhance health communication, particularly through technology. I see many public health issues, from violence prevention, to health disparities, to patient and provider communication that I believe we need to address. Are you currently reading anything for fun? I recently finished reading The Sympathizer for fun. It has absolutely no connection to my research, but sometimes we have to let our mind wander, right? Thanks to Dr. Guetterman for sharing a bit about yourself. 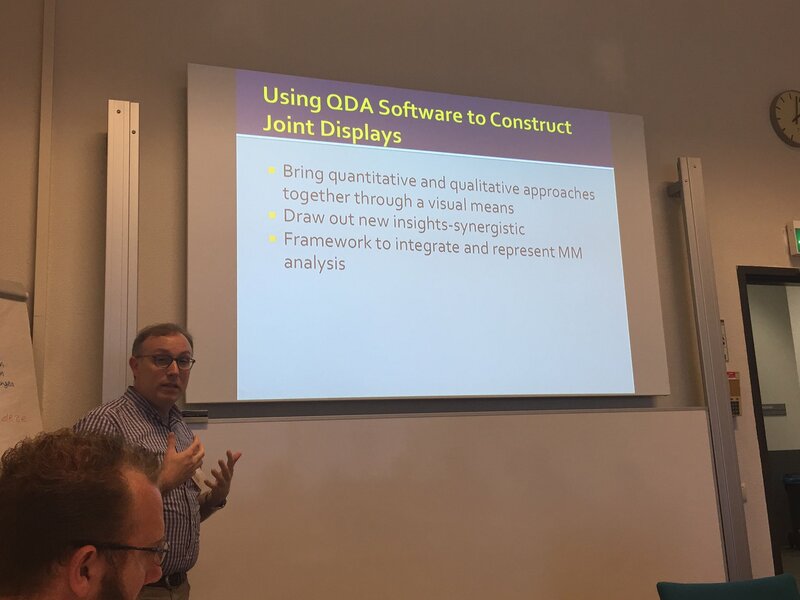 He recently returned to Ann Arbor, after a busy week in the Netherlands and Denmark, where he presented at the qualitative research KWALON conference in Rotterdam and taught a week-long mixed methods course with Justine Wu, M.D., M.P.H., at Aalborg University Hospital in Aalborg, Denmark.